I've got two pictures to share with you tonight, before I hit the sack. 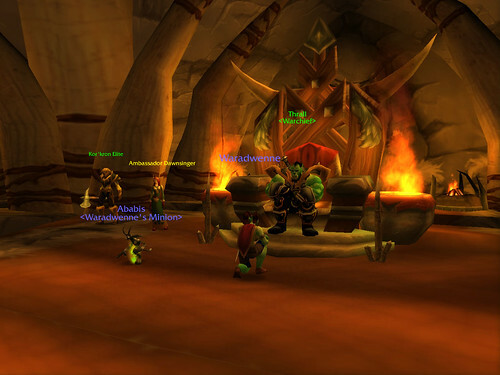 First, I took a nice picture of Waradwenne's first meeting with Thrall. Second, my first group picture with a soon-to-be-antiPUG-guildie. 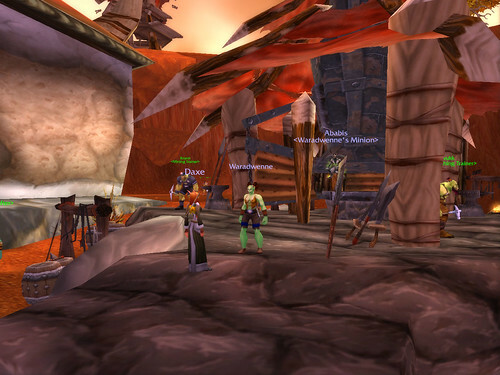 Daxe is the tailoring specialist right now, having made an extremely helpful set of bags for our toons. I had forgotten how painful it is to run around with only 16 bag slots available! She also made me a nice [Barbaric Linen Vest], which she claims makes me look like I'm actually wearing a top, and some pants which are in the mail [Handstitched Linen Britches]. Here we are meeting in Razor Hill, flirting and laughing with each other. Very fun. Dig my plunging neckline, too. Hawt, right? I hate Thunderbluff; you can't find a good burger anywhere!